Monsen Engineering is the exclusive provider of this efficient new way to manage your document archives. Never before has it been so simple to track all of your related documents in one easy to access location. We recognize that every project and every client is unique. Our system is fully customizable to meet your needs. Therefore, we offer two Digital Revolution options. Imagine - all of your archive documents at your fingertips. Access it all within a couple of clicks - drawings, specifications, ASI's, RFI's, photo documentation - its all there in your permanent archive. Eliminate the clutter and storage of paper document archives. Never lose track of as-built drawings or O&M manuals again. 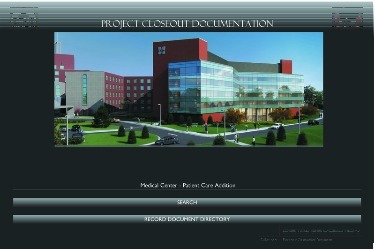 You can have every document related to your completed project at your fingertips. Access it all within a couple of clicks - as-built drawings, specifications, RFI's, O&M mauals, test reports, training videos, photo documentation - it's all there in your permanent archive. Eliminate the time and cost of a traditional paper closeout. You'll be amazed by the elegant simplicity, ease of use, and accessibility of your project documentation. Scanning to an electric file is only the first step. We take it to the next level and deliver a package that's simple and usable. Join us in bringing your archived projects into the digital age! What document types can be included? Contact R.P. Monsen at 800-821-0672 for pricing and more information!